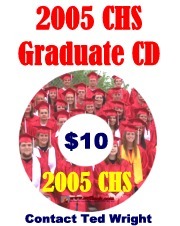 You can click many of the photos on the 2005 graduate pages and link to the cvilleok.com page related to that photo. A fresh pile of asphalt (for the top layer) waits at the back drive of the new Fire/EMS building while the crews were working on the front drive Wednesday May 25th. This worker is connecting the new roof trusses near the front (Main Street side) of the historic City Hall building. The top layer of asphalt was being smoothed Wednesday morning for the front drive of the new Fire/EMS building just west of City Hall at 12th and Main in Collinsville. The city fire department will be moving into the facility soon (from their temporary location at the old recyling center at 156th St. N.) and the EMS crew and equipment will be moving from across the alley. Another view inside the City Hall reconstruction where, in the recent words of City Planner (& Acting City Manager) Bob Wolfram, they are "fixing the hole in the roof". City Staff will hopefully be relocating back here sometime around Thanksgiving this year (from the temporary City Hall near the Fair Grounds at 901 W. Center).